my mom came for a visit. and in among all the naps and books and afternoon tea, we went on some adventures. my list had been growing…things that are hard to do on the bus, things that take us a bit farther afield. in this case all the way to Milwaukie! the store is worth a visit…every Bob’s product under the sun. and some in larger quantities. we went nuts and spent our half off coupon on 25 pounds of black beans. crazy! there’s a lovely mural of the history of the mill and a waterwheel and millstones. 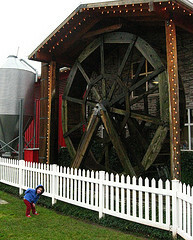 though the real mill is at another location. breakfast was unremarkable. but i loved Bob’s favorite corn grits with cheese.